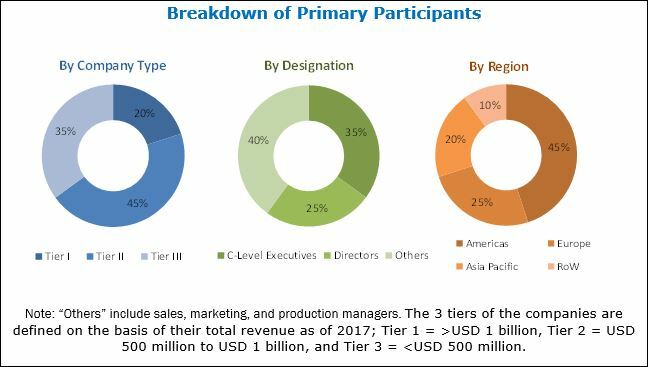 [171 Pages Report] The overall structural health monitoring market was valued at USD 1.24 billion in 2017 and is estimated to reach USD 3.38 billion by 2023, at a CAGR of 17.93% between 2018 and 2023. 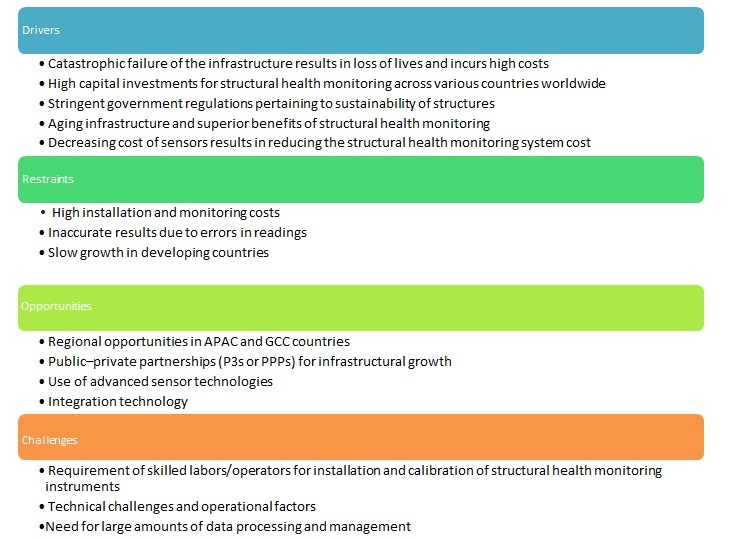 Major factors driving the growth of the structural health monitoring market include high capital investments for structural health monitoring across various countries, stringent environmental regulations pertaining to the sustainability of structures, and a decrease in the cost of sensors that results in reducing the cost of the structural health monitoring system, among others. APAC is expected to be the fastest-growing market for structural health monitoring market. This growth can be due to the rapid infrastructure building activities being undertaken in APAC, mainly China, India, and Japan where structural health monitoring paves the way for the modernization of infrastructure. The base year used for this study is 2017, and the forecast period considered is from 2018 to 2023. Most of the suppliers have opted product launch and development and acquisition as the key strategies as could be seen from the recent developments. Where will it take the industry in the mid-to-long term? The research methodology used to estimate and forecast the global structural health monitoring market begins with obtaining data on key vendor revenues through secondary research. Some of the secondary sources used in this research include various journals and databases such as the Aerospace Industry Steering Committee for Structural Health Monitoring (AISC-SHM), The Federal Highway Administration (FHWA), IEEE journals, Factiva, Hoovers, and OneSource. Multiple on-field discussions have been conducted with key opinion leaders across each major company involved in the development of structural health monitoring for various applications in different regions to understanding the demand for structural health monitoring products in various regions. The key players in the market have been identified through secondary research, and their market share in the respective regions have been determined through primary and secondary research. The structural health monitoring ecosystem includes hardware component offering companies such as Nova Metrix (US), Geokon (US), Campbell Scientific (US), RST Instruments (Canada), and Sisgeo (Italy). A few software and service providers include COWI (Denmark), Geocomp (US), Acellent (US), and SIXENSE (France), among many others. In October 2017, Campbell Scientific (US) launched the CR310 data acquisition system. This system is designed for making accurate measurements pertaining to weather and water monitoring, structural monitoring, and windfarm station monitoring applications. In June 2017, Acellent and TESTIA (Germany) announced the collaboration for the installation, marketing, and commercialization of Acellent’s structural health monitoring products. TESTIA is one of the prominent companies in Germany and Europe that provide nondestructive testing (NDT) services and quality services to the aerospace industry. TESTIA wants to expand its offerings in the structural health monitoring segment. With this collaboration, Acellent would expand its business in Europe. In March 2017, COWI (Denmark) acquired Projektbyrån, a Swedish company expert in project management services. This acquisition is expected to help COWI to grow further using Projektbyrån’s key competencies in various complex projects. In December 2016, Acellent (US) launched various new products and solutions pertaining to infrastructure health monitoring, namely ScanGenie III, a data collection hardware; SHM Pro Software Suite, software that fulfills the requirement of data processing and analysis; and SMART Layer II Sensor Network, which monitors the health of a wide variety of structures. With this launch, the company is expanding its portfolio of the products used for structural health monitoring. 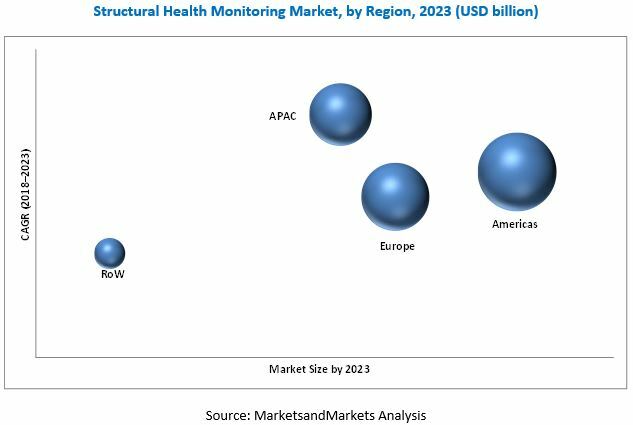 The structural health monitoring market is estimated to grow from USD 1.48 billion in 2018 to USD 3.38 billion by 2023, at a CAGR of 17.93% between 2018 and 2023. The forecast period for this report is considered between 2018 and 2023. The factors that are driving the structural health monitoring market include the aging infrastructure and the superior benefits of structural health monitoring, a decrease in the cost of sensors that results in reducing the structural health monitoring system cost, and stringent environmental regulations pertaining to the sustainability of structures, among many others. In this report, the structural health monitoring market has been segmented on the basis of technology, offering, vertical, and geography. Based on technology, the market for structural health monitoring systems based on wireless technology is estimated to grow at a higher rate during the forecast period. In wireless technology, the use of wires is eliminated, thereby abolishing the need for installation and protection of cables due to which the cost of the wireless structural health monitoring system is reduced dramatically. In terms of offerings, the hardware segment is expected to hold a larger market share by 2023 owing to the fact that hardware components are the integral elements of the structural health monitoring system, which measure physical properties of any structure under observation. On the basis of received data from various hardware instruments, decisions are made regarding the corrective actions pertaining to the structure. In the vertical segment, civil infrastructure is expected to hold the largest market share during the forecast period. Civil infrastructure facilities include numerous critical structures such as bridges, dams, tunnels, highways, and buildings. At present, major countries in different regions such as the US, the UK, Germany, and Japan are heavily investing in building infrastructural facilities, thereby ultimately growing the economy of the country. Thus, the growing civil infrastructure would increase the demand for structural health monitoring systems to maintain and monitor the health of each civil infrastructure and to avoid catastrophic failure of these structures. The growth of the structural health monitoring market in the Americas is likely to be propelled by the driving factors such as the aging infrastructure, support from various governments in the region, and need for effective solutions for the maintenance of infrastructure facilities. Furthermore, according to the Federal Highway Administration (FHWA) in the US, more than 30% of the structures, such as bridges and tunnels, have exceeded their 50 years of design life. So, to enhance the public safety and improve the structural lifespan, the implementation of the structural health monitoring system is a must. Such factors would further contribute to the growth of the market in the Americas. However, high installation and monitoring costs, inaccurate results due to errors in readings, and slow growth in developing countries are a few major restraining factors for the growth of the structural health monitoring market. Civil infrastructures include numerous critical structures such as bridges, dams, tunnels, highways, and buildings. At present, major countries in different regions such as the US, the UK, Germany, Japan, China, India, Qatar, and Saudi Arabia are heavily investing in building infrastructural facilities, thereby ultimately growing the economy of the country. For example, the I-4 Ultimate project, Central Florida (US), is in the construction phase. This project will rebuild 21 miles of Interstate 4 (I-4) from west of Kirkman Road in Orange County to the east of State Road (SR) 434 in Seminole County, add 2 new dynamic tolled express lanes in each direction. The overall investment is approximately USD 2.3 billion. Thus, the growing civil infrastructure would increase the demand for structural health monitoring systems to maintain and monitor the health of each civil infrastructure and to avoid catastrophic failures of these structures. In the aerospace & defense industry, stress and strain are the 2 important parameters that determine the longevity and operational safety of any flight-bound vehicles, such as hybrid vehicles, massive jets, and sleek new fighters. The monitoring system, which is equipped with various sensors, provides a detailed picture of the health of an aircraft. Monitoring systems monitor and analyze the integrity of structures and capture aircraft component positioning feedback through continuously monitoring various parameters such as strain, temperature, stress, and loads. With the help of this data, structural engineers can further strengthen the safety, reduce maintenance, and enhance the in-flight efficiency of aircraft. Furthermore, countries such as the US, Russia, and China are heavily investing in the aerospace & defense industry to improve the safety and efficiency of aerospace and defense equipment; therefore, the structural health monitoring market is expected to grow at the highest CAGR between 2018 and 2023. In the energy sector, structural health monitoring systems are used for condition monitoring of wind turbine blades. The monitoring is done for blades, turbine towers, and foundations (on-shore or off-shore) in the wind turbine power generation. The use of structural health monitoring systems in the energy sector is growing owing to the increasing demand for various applications such as wind turbines, nuclear power plants, hydropower plants, and dams. To carry out the efficient operation of power plants, the structures toned to be in flawless conditions. To achieve this, structural health monitoring systems/technologies/methods are implemented. Structural health monitoring plays a crucial role in the mining sector. Monitoring is necessary to access the geographical conditions in the mines exactly. With the help of monitoring systems (sensor network), and specimens can be monitored by quickly collecting the information from different sensors, along with various structures such as brick walls and compacted soils. In the mining scenario, various auxiliary structures, for example, tailings impoundments need to be built. It requires a thorough assessment as well as continuous monitoring to ensure the prevention of environmental disasters. Several wired as well as wireless sensors, DAS, and cameras are used for monitoring mines. Others include industrial machinery, automotive, and marine structures. The increasing need for safety and structural monitoring has increased the demand for monitoring systems in these segments. For example, in marine structures, ultrasonic and acoustic sensors are widely used to detect the hairline crack as it could lead to huge disaster and loss of human lives. Such advanced monitoring systems help structural engineers to extend the life of various equipment further. The key restraining factors impacting the growth of the structural health monitoring market include high installation and monitoring cost, inaccurate results due to error in readings and slow growth in developing countries. The impact of this restraint is high at present; however, in the future, the impact is expected to subside. A few key players in the structural health monitoring market are COWI (Denmark), Pure Technologies (Canada), Structural Monitoring Systems (Australia), Acellent (US), Geocomp (US), Campbell Scientific (US), Nova Metrix (US), Geokon (US), SIXENSE (France), Digitexx (US), Bridge Diagnostics (US), Sisgeo (Italy), RST Instruments (Canada), AVT Reliability (UK), and Geomotion Singapore (Singapore). *Details on Business Overview, Products & Solutions Offered, Brand-Wise Product Offerings, Recent Developments, SWOT Analysis and MnM View Might Not Be Captured in Case of Unlisted Companies.